I don't remember first edition AD&D being big on giving DMs tools to make things themselves. There was the DMG's random demon generator (creatures from the lower planes, actually), the random dungeon generator, and the system for determining artifact powers (which was a bit of genius). Mostly the game seemed more concerned with defining things in the universe of AD&D than helping you make your own. That's why Oriental Adventures' martial arts system surprised and pleased me so much. It came at the tail end of 1e and corresponded with a break I took from gaming, so I never got to use it in play, but it's so beautifully modular, it makes me want to give pcs martial arts now, just to try it out. Basically, all you have to do is keep track of the number of attacks per round, the AC a style gives you, the damage of a typical strike, a small assortment of special maneuvers that can be learned, and you're done. Better than that, the book took the attitude that DM's would want to create their own, so it only gave you stats for four real world styles (Karate, Kung-fu, Tae Kwon Do, Jujutsu) and a little table to help you create new ones. By picking whether a style is "hard," "soft" or in between, you can determine the rest of the necessary details. 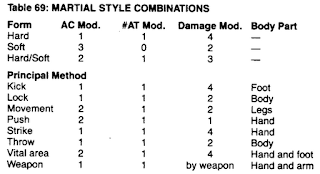 None of these categories have more than 6, and most have just 3 special maneuvers. The system has the clever addition that moves can only be learned in order of difficulty-- so you can't jump to a powerful 3 strike, until you've learned all the styles 1 and 2 ranked moves (or every category). Combining this with the fact that you use proficiency slots to learn maneuvers, there's a minimum level most players will need to do devestating moves. Now, some criticisms. I would skip the unneeded proficiency step and just say you can learn some number of maneuvers each level. That's not a big change, but would simplify things (especially since I'm not using proficiency slots for anything else). My main criticism is that most of the maneuvers are boring to me. The usual strategy is a higher number means more damage with usually no sacrifice. That means by the second level of strike you're already doing as much damage as a 2-handed sword multiple times a round with your hands. I'd want to play around so that maneuvers would be useful but also choices for players (there are a few of these in the system, but only a few). I'd also like to see if I could limit the moves to around four for each category-- to simplify a little bit. And I'd like to make a one page summary with some generic styles already built. For example, a hard striking style, a throwing style, a submission style, etc. These could be re-named or combined as needed (I find it helpful to have a bare minimum already constructed that cool exotic stuff can be derived from). Oh, yeah, another cool part of this system was that a player that learned multiple styles could make their own style mixing and matching parts from each. I thought that was pretty sweet. I'm not sure which of the several folks credited with the OA book designed the martial arts system, but I say good work. I hope to produce my own little tweaks before year's end. Hope you are all well. I've always wondered why unarmed combat in D&D is always covered in such bone-aching detail... Armed combat is simply, "I hit for 2 damage. I miss. I hit." Nobody worries about whether the Italian school of rapier should convey different bonuses than the Spanish, or whether German or Italian longsword technique should do more damage. 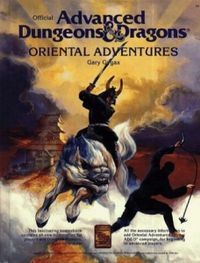 Anything like that is considered "flavour", to be added by the player in their character description and by the DM in their description of events. It seems to me like unarmed combat should be handled in the same manner (Which is pretty much how the monk class works, right? I don't actually know, I've never played with that class.). Could be fun when coming up with new styles! 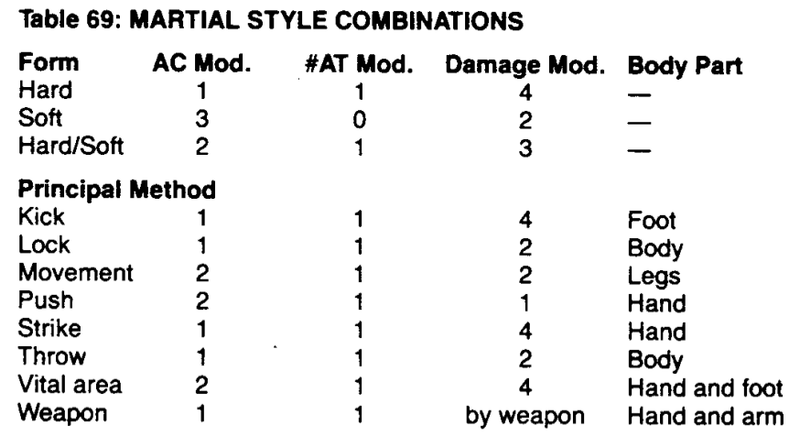 The historical supplement HR4 A Mighty Fortress actually does detail mechanical differences between different sword duelling techniques. I have been less and less in favor of this kind of differentiation recently, myself. I think this is because I've been turning combat more into a thing to be avoided if at all possible, and resolved quickly and brutally when it does occur (this kind of combat is very well served by the simple back and forth of I swing, I hit that D&D is often castigated for). It only works if modifiers are kept to a minimum and hit point totals are kept low though. Get a copy of Ninjas and Superspies. Palladium system aside, Erick Wujik did a bangup job on marital arts there. Easy to port over to AD&D as the same 3d6 attribute scale is used. @Charles: I think it's probably because a lot more people are familiar with fantasy martial arts than actual schools of melee combat. I could tell you all about Jackie Chan's Drunken Boxing, but have no idea what the difference between Spanish and Italian rapier use would be. That said, one of the things I like about this system is how much abstraction it does use. There is no blocking mechanic; all the blocking and dodging is boiled down to an effective AC. Also, I'm not against more choices for players in typical combat, and wouldn't mind an interesting differentiation between those rapier styles. But I know from experience that it's very tricky to add stuff to D&D's combat without shifting the whole focus of the game to fighting. @Tedankhamen: I'll try and take a look. Is it modular and pretty simple?